As a beginner, I tried a programming drill. The method gets an Enumerable that contains numbers specifying how many "*" to print on each line. What impact on the GC will creating so many strings have? Which way is more efficient, and how would you prefer to do it? Write("*") benefits from string interning, so there should be little to no GC overhead (other than what Write does internally, of course). However, Write has to be called for every single character, and that call overhead makes it (significantly) slower. The WriteLine variant does allocate strings (among other things), so the GC will have to run more often. Whether that has any significant impact on performance is something you'll have to measure, but it's normally not something you need to worry about. new string('*', numberOfTimes) is more efficient (both in terms of speed and in terms of allocations) than string.Concat(Enumerable.Repeat("*", numberOfTimes)). You may run into different kinds of issues if you allocate a lot of very large objects (larger than 85.000 bytes), due to how the Large Object Heap works. But that's probably not relevant in this case. Note that new .NET releases occasionally contain GC improvements, so while the general principles are probably fairly static, implementation details will change over time. It seems (on my computer, at least) that the overhead of creating lots of strings way less important than the overhead of repeated calls to Console.Write(). 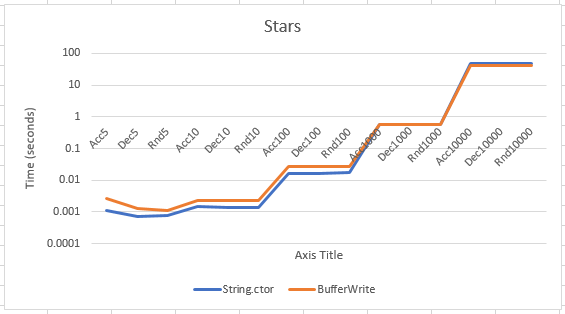 However, we can pretty much get the best of both worlds by using a buffer of stars, and using the Console.WriteLine(char buffer, int index, int count) overload: create one big string (buffer) and just read as much as we need each time. Uses no-more than four as much memory as your solution. The x-axis the type of IEnumerable<int>: Acc<n> means count up to n, Dec<n> means count down from n, Rnd<n> means produce n random numbers in the range [0,n]. It shows what appears to be this 'buffered' method outperforming your first solution (with string.ctor(char, int) fix, as suggested by others) for longer/more strings. It is interesting to see just how well string.ctor(char, int) performs. It is an externed function, which helps, but as the strings get longer, I would expect the buffering to pay off more and more. The graph shouldn't be wholly convincing (if I could be bothered to leave it running for a while longer, we might see the buffered method really paying off for larger and more numbers. You should absolutely ignore the results for small n. Each data point is the total time taken for 100 repeats (shuffled every 10). I apologise for how terrible the plot styling is, I don't know how to use spread sheet software. Again, this is how this thing ran on my computer, it could well be different for you, and you shouldn't attempt to make general inferences from these results (or any results on such a contrived problem). Strings in .NET are "interned" which means every string you create is cached for the life of the application, so if you use the same string twice, you are using the same instance as before. So as far as garbage collection goes, I don't think it matters. Using a for loop is probably faster than Enumerable though. Not the answer you're looking for? Browse other questions tagged c# beginner comparative-review ascii-art or ask your own question.